US Central Command (USCENTCOM) located at MacDill Air Force Base, Tampa, Florida, is the unified command responsible for US security interests in 27 nations that stretch from the Horn of Africa through the Arabian Gulf region, into Central Asia. USCENTCOM is one of nine unified commands in the Department of Defense. The command was activated in January 1983 as the successor to the Rapid Deployment Joint Task Force. The US Central Command carries out its missions and objectives through its joint-service headquarters staff at MacDill AFB, Florida, and its component commands from all four services. USCENTCOM also maintains a significant forward presence in the AOR consisting of combat forces from all four services. USCENTCOM is comprised of components from the Army, Marine Corps, Navy, Air Force, and Special Operations Command. During exercises or contingency operations, the services provide forces to each of these component commands. US forces apportioned to USCENTCOM are unique. There are few permanently forward-deployed forces in the area. Those consist mainly of US Navy Central Command or US Marine Central Command missions. The OPLAN and TPFDD identify the vast majority of forces. The headquarters staff includes over 900 personnel from each of the four military services. Each of the services also provides USCENTCOM with component commands, which, along with the joint special operations component, make up USCENTCOM's primary warfighting and engagement organizations. Events of the late 1970's threatened the stability of the Central Region and placed vital US interests at risk. Following the revolution and subsequent fall of the Shah of Iran, and the Soviet invasion of Afghanistan, the Rapid Deployment Joint Task Force (RDJTF) was formed at MacDill AFB, Florida on 1 March 1980. During 1981 and 1982 it evolved from a worldwide deployable force to a de facto regional unified command representing US interests in the Middle East and the Horn of Africa. As a result of this evolution, the RDJTF was deactivated on 31 December 1982, to be replaced with the US Central Command on 1 January 1983. Within Saudi Arabia, the US Military Training Mission and Office of the Program Manager, Saudi Arabian National Guard (SANG) were two separate "noncombatant" organizations. The Office of the Program Manager, Saudi Arabian National Guard, a "stovepipe" organization reported to the US Army Materiel Command, Alexandria, Virginia, and had at least 136 US service members and five separate compounds. Its mission as a security assistance organization was to train the Saudi Arabian National Guard for land defense of the Kingdom of Saudi Arabia. The US Military Training Mission, a joint security assistance organization, had approximately 190 U.S. military employees at various locations. There were other stovepipe organizations in the theater. They included numerous Technical Assistance Field Teams (TAFT) and offices and individuals from the US Army Corps of Engineers, Air Force Materiel Command, Center for Naval Analysis, Defense Logistics Agency, DoD Schools System, Defense Courier Service, Defense Commissary Agency, Air Mobility Command, Military Sealift Command, and Military Transportation Management Command, among others. None of these organizations were assigned to US Central Command. They were specifically exempted by the Secretary of Defense. The Chief, US Military Training Mission was the US Defense Representative for Saudi Arabia. He was not in the chain of command of the Program Manager, Saudi Arabian National Guard or any other stovepipe organization. 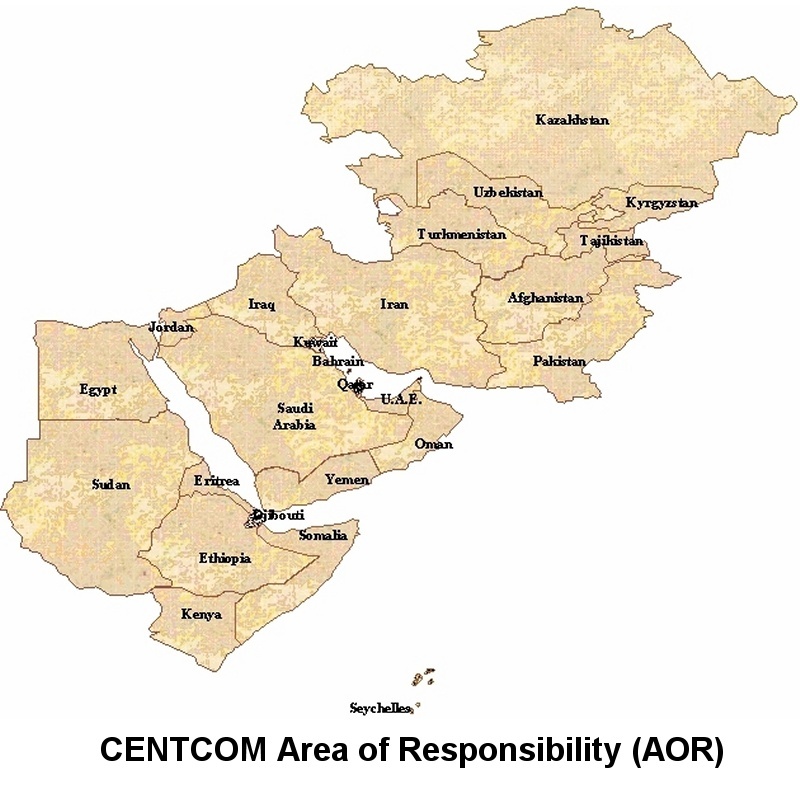 United States Central Command's Area of Responsibility (AOR) includes 22 nations, ranging from Egypt in the West to Pakistan in the East, and Kazakhstan in the North. The 27 countries within the AOR were: Afghanistan, Bahrain, Djibouti, Egypt, Iran, Iraq, Jordan, Kazakhstan, Kuwait, Kyrgyzstan, Lebanon, Oman, Pakistan, Qatar, Saudi Arabia, Seychelles, Syria, Tajikistan, Turkmenistan, United Arab Emirates, Uzbekistan, and Yemen. 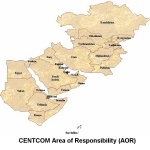 Lebanon and Syria were not originally part of USCENTCOM's AOR. On 1 October 1999, USCENTCOM assumed responsibility for all US military engagement activities, planning, and operations for the five Central Asian states. USCENTCOM was responsible for peacetime engagement planning and program execution for the five countries in the Central Asian Region: Turkmenistan, Uzbekistan, Kazakhstan, Kyrgyzstan, and Tajikistan. The Area of Responsibility includes the waters of the Red Sea, Arabian Gulf, and the Western portions of the Indian Ocean. The region comprises an area larger than the continental United States, stretching more than 3,600 miles East-to-West and 4,600 miles North-to-South. It includes mountain ranges with elevations exceeding 24,000 feet, desert areas below sea level and temperatures ranging from below freezing to more than 130 degrees Fahrenheit. It remains, as it has for centuries, a region of diversity, with different cultures, religions, economic conditions, demographics, and forms of government. Instability in the South and Central Asian Sub-Region, especially in Pakistan and Afghanistan, created uncertainty that extended beyond the Central region. Indo-Pakistan disputes over Kashmir, border demarcation, and water rights continued to fuel historic animosity. The mistrust engendered undermined efforts to promote nonproliferation and threatens world security. Continued instability in Afghanistan inhibited efforts to open traditional trade routes thereby limiting Central Asian states economic options and stymieing access to warm water ports on the Arabian Sea. The emergence of the fundamentalist Sunni Taliban had provided some stability to portions of Afghanistan, but had further aggravated political upheaval and armed conflict in and around the Kabul area escalating the then ongoing civil war. Iran was rebuilding military capabilities at a rate exceeding that required for defensive purposes, alarming the US and members of the GCC. To curb Iran's expansion, the Clinton administration enacted sanctions prohibiting trade and investment in Iran. Congress continued to pass more legislation restricting US involvement with Iran. HNS potential ranges from good to nonexistent, depending on the specific country involved. LOCs also varied from the few regularly used in support of pre-positioned supplies, equipment, and personnel; to those used periodically for exercises; to those identified but not used due to political considerations. In the period following the terrorist attacks in the United States on 11 September 2001, USCENTCOM's AOR became the primary focus of the Global War on Terror. Major operations in Afghanistan and Iraq were followed with additional missions to the Horn of Africa and elsewhere in the AOR.